Acute urinary retention in women is uncommon. A 63 year old woman presented with suprapubic pain, a palpable bladder, and multiple grouped vesicles on the right buttock. Catheterisation showed a residual of 2000 ml. A case is reported of acute urinary retention secondary to herpes zoster infection of the sacral nerves (S2–4). A 63 year old woman presented to the accident and emergency department complaining of suprapubic pain and an inability to void urine. Over the previous few days she had noticed that her urinary stream was declining. There was no previous history of urological problems. However, the patient was prone to constipation, her last bowel movement being two days previously. History was significant for a laminectomy performed 25 years earlier. Physical examination showed a bladder distended to the umbilicus and on rectal examination there was soft faeces present. There was no neurological deficit in the perineum or lower limbs, but multiple grouped vesicles were noticed on the right buttock. These had been developing over the previous four to five days (fig 1). The patient recalled having chicken pox as a child but had no previous skin complaints. Multiple grouped vesicles on the right buttock. A bladder catheter was inserted draining a residual volume of 2000 ml. Direct urine microscopy was normal, and a mid-stream urine specimen did not detect any significant bacterial growth. The initial blood tests were consistent with a post-obstructive uropathy (urea 10.5 mmol/l, creatinine 157 μmol/l.) This however resolved after catheterisation (urea 6.0 mmol/l, creatinine 115 μmol/l.) A swab was taken from the right buttock and polymerase chain reaction analysis confirmed the presence of varicella zoster virus. Further investigation included a normal ultrasound scan of renal tracts and pelvis. Cystoscopy showed a healthy bladder with a large capacity and a rigid sigmoidoscopy to 15 cm was normal. The patient was given oral acyclovir. A trial removal of catheter three weeks later was unsuccessful but when the catheter was removed a further eight weeks later, the patient was able to pass urine as normal. We report a case of acute urinary retention secondary to herpes zoster infection of the sacral nerve roots (S2–4). This cause was first reported in the literature in 1890.2 Since then less than 150 cases have been reported worldwide.3,4 Herpes zoster is an infection attributable to the varicella virus. 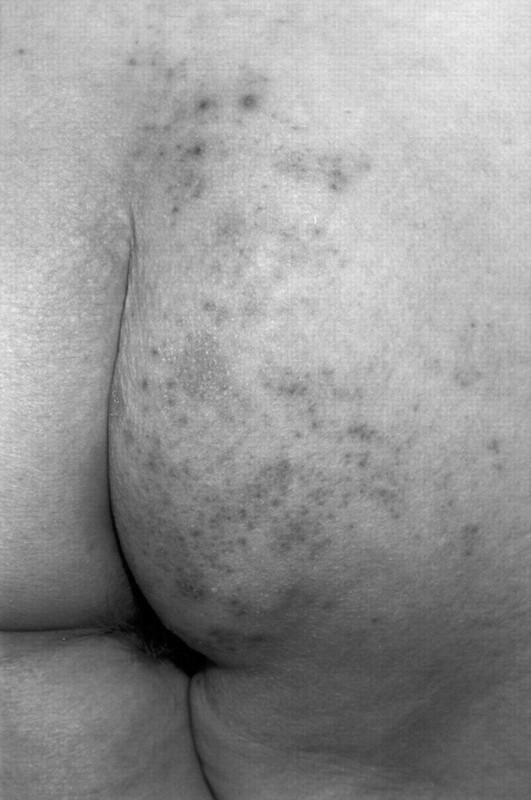 A painful vesicular rash is noted that affects one or more dermatomes and is associated with an inflammatory reaction (nerve cell necrosis, lymphocytic infiltration, and haemorrhage).5 A neuropathic bladder develops because of involvement of the detrusor reflex. The cystoscopy in this patient showed a healthy bladder with a large capacity. However, in previous cases there have been intravesical lesions associated with an inflamed bladder wall.9 In this case cystoscopy was carried out early on, therefore the lesions may not have become apparent. In conclusion, the prognosis for acute urinary retention secondary to herpes zoster of S2–4 is usually benign. The detrusor muscle should recover to normal function. Initial treatment is by catheterisation, either urethral or suprapubic if indicated. A course of oral acyclovir is required, and treatment of secondary bacterial infection if present. Follow up urodynamic studies will confirm the return of detrusor function. We would like to make any practising physician aware that this is an uncommon cause of a commonly diagnosed condition. Dauleh MI, Byrne DJ. Unusual cause of acute retention of urine. J R Coll Surg Edinb1995;40:197. Davidsah H . Communication. Berl Munch Tierarztl Wochenschr1890;27:695. Broseta E , Osca JM, Morera J, et al. Urological manifestations of herpes zoster. Eur Urol1993;24:244–7. Yamanishi T , Yasuda K, Sakakibara R, et al. Urinary retention due to herpes virus infection. Neurourol Urodyn1998;17:613–19. Clason AE, McGeorge A, Garland C, et al. Urinary retention and granulomatous prostatitis following sacral herpes zoster infection. Br J Urol1982;54:166–9. Ginsberg PC, Harkaway RD, Elisco AJ. Rare presentation of acute urinary retention secondary to herpes zoster. J Am Osteopath Assoc1998;98:508–9. Oates JK. Greenhouse PRDH: Retention of urine in anogenital herpetic infection. Lancet1978;i:691–2. Cohen LM, Fowler JF, Owen LG, et al. Urinary retention associated with herpes zoster infection. Int J Dermatol1993;32:24–6. Tsai Hn , Wu WJ, Huang SP, et al. Herpes zoster induced neuropathic bladder—a case report. Kaohsiung J Med Sci2002;18:39–44.